Niue is becoming renowned as a hotspot for viewing humpback whales. The Pacific populations head north from their summer feeding grounds in the Antarctic to breed in warmer tropical waters, mainly around Samoa and Tonga. 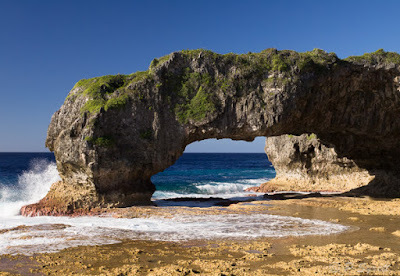 In recent years, Niue has increasingly become a breeding area too, so that whales are active around the island for much of the winter, between June and September. Although there are operators running ‘swimming with whales’ tours, which are very popular with tourists, I prefer to watch from the shore. 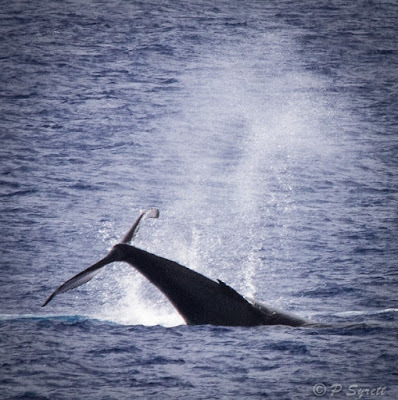 While on Niue, on several occasions I watched a tourist boat approach a whale, which then dove and surfaced again some distance away. Rather than leave the whale alone, the boat then approached again, forcing the whale to dive once more. 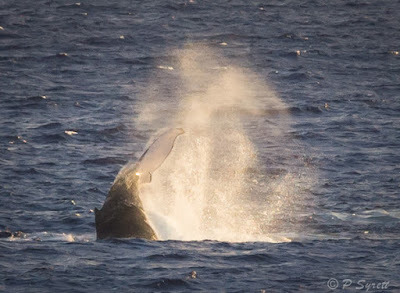 Although I believe that most operators are reasonably sensitive to the wellbeing of the whales, under pressure from enthusiastic visitors, I cannot help but feel there is likely to be some degree of harassment. These whales travel a long distance to breed and do not feed again until they return to Antarctic waters, living off their stored fat reserves. If swimming with whales is regarded as the ultimate experience, viewing from the shore is amazing and very satisfying for me. 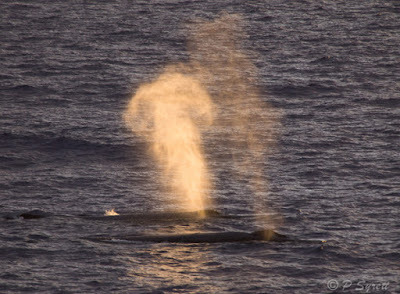 We regularly heard whales at night from our cliff top accommodation, and watched them during the day from many superb vantage points around the island. 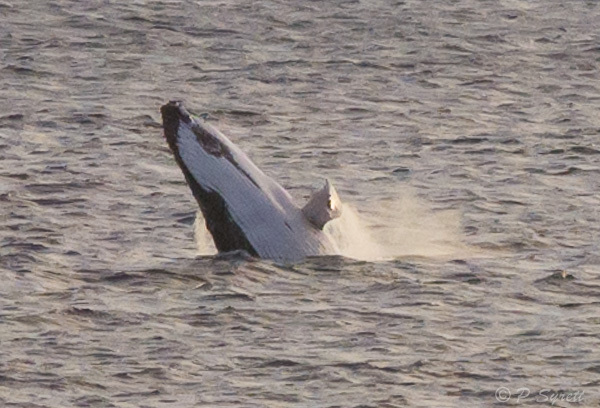 We saw females with calves, copulating pairs, breaching and spy hopping. One of the best viewing spots was the Sails Bar, brilliantly situated on a headland with a 180-degree plus view out over the ocean. 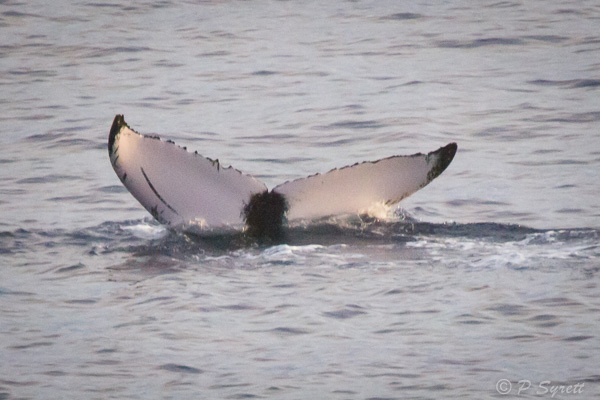 On one occasion, a whale breached very close to shore while we were walking on the reef platform, giving us a real appreciation of the size of these animals. I didn’t get my camera out fast enough to capture the moment, but I shall never forget it. Many times we watched whales cruising past close to the surface, easily visible through the clear water. I was surprised at how fast they travelled in their seemingly unhurried fashion. Overall, I believe that tourist operations benefit nature conservation, as without public appreciation of the value of nature, humans are more likely to exploit the natural environment for gains of a more damaging kind. Personally I prefer a more ‘hands-off’ approach, watching nature from a distance without interaction because I am more interested in how wildlife relate to each other than to humans. I found the photography difficult, even though we had such good views of the whales. Being fast on the shutter button was important, because they travelled fast and were out of the water for only a short time when breaching or spy hopping. The light wasn’t always easy, either. During the day it was often harsh with high contrast. Also, because some of the activity was at a distance, the sensor of my camera (Olympus E5) didn’t have enough megapixels to allow as much cropping as I would have liked. In addition, when the light was better at the ends of the day, there was less of it; so to maintain a high shutter speed the necessary high ISO resulted in a lot of noise with the Olympus (or the compromise lower shutter speed gave a blurry image). With my new Nikon D750, I would get far less noise, better definition, and more detail in the shadows. So now I need to plan my next visit!